New improved formula, specially for dogs and cats! Now combines the most essential Cortaflex ingredients into an easy "sprinkle and mix" capsule. Order 2 or more bottles of ANY Canine or Human product for FREE UK DELIVERY! Contains Cortaflex's unique formulation combined with Hyaluronic Acid for the maintenance of healthy joints, less stiffness and better mobility. These ingredients are supported by the anti-inflammatory and antioxidant benefits of Curcumin - a substance in Turmeric which is believed to relieve the symptoms of various forms of arthritis. The delivery of all these key ingredients is further enhanced by BioPerine®, a patented extract of Black Pepper fruit (Piper Nigrum), which has been shown to improve the absorption of key ingredients by at least 30%. As such, BioPerine® acts as a bioavailability enhancer. The capsules provide a precisely metered dose - simply twist the capsule open and sprinkle and mix the contents into your dog or cats' food. Small dogs and cats - 1 capsule per day. Large dogs (over 10kg) 2 capsules per day. Cortaflex Powder for dogs and cats, fortified with Hyaluronic Acid, simply sprinkle on your pet's normal feed. A more powerful formulation for quick results. Super-fenn is a powerful and natural formulation of nature’s most potent anti-inflamatories and pain killers. Approved by vets. When fed alongside Cortaflex: results can be dramatic. For dogs with tired and stiff joints or poor joint mobility, see the difference in days! Unlike some of the vet drugs, Canine SUPER-FENN has no known side effects. This 240gm tub of granules (simply mix with normal feed) will last a medium sized dog approximately 30 days. Cortaflex or Super-Fenn - or both? Super-Fenn eases pain whereas Cortaflex improves the quality of joint lubricating fluid as well as repairing and maintaining healthy cartilage. By feeding both: you get maximum benefit for all your dog's joints... leading to improved mobility and a new lease of life. Lower priced Canine Joint Supplement. Not as powerful as the normal Canine Cortaflex shown above, Canine Joint Care can be used as a preventative or maintenance measure to help prolong the life of healthy joints. This 160gm pack of powder will last a medium sized dog approximately 4 months. You can now feed Cortaflex Joint Care sooner rather than later - especially for competition and working dogs - even 6 months old isn't too early to start. Help maintain your dogs' youthful mobility with NEW Canine Cortaflex Joint Care. The power of Canine & Feline Cortaflex HA in a convenient capsule form. For the maintenance of healthy joints for dogs and cats. Dosage - small dogs and cats one a day, large dogs 2 a day. 60 capsules in each bottle. Cortaflex Powder is simply sprinkled on your dog or cat's feed and the 120g tub lasts a medium sized dog 90 days. Measure and full feeding instructions for all sizes of dog and cat included. Full list of ingredients on the right. Brand new, natural pain-killer and anti-inflammatory for dogs: approved by Vets! The natural ingredients in Canine Super-Fenn are known to act as powerful anti-inflamatories and pain killers with NO KNOWN SIDE EFFECTS! Tub lasts a medium sized dog 4 months. Not as powerful as the normal Cortaflex range - used as a preventative measure to help prolong the life of healthy joints. Feed young or competition and working dogs from just 6 months old. Description: Canine Cortaflex - capsules, powder or Joint Care for the maintenance of your dogs healthy joints. Ingredients, dosage, hyaluronic acid, HA, Canine Joint Care and New Canine Super-Fenn. Most people know about the benefits of Glucosamine and Chondroitin for healthy joints. They work - they help! Most people are familiar with this: in spite of the fact that they don't work very well because their molecules are too big to pass into the cells of the joints where they are needed. Imagine a joint supplement where these compounds are already broken down into smaller parts, more easily absorbed, more easily utilised - EVEN MORE EFFECTIVE! Cortaflex is the world's best selling joint supplement - can you imagine why? Canine Cortaflex - actually, it's called Canine & Feline Cortaflex HA as it is for both dogs and cats - comes in three types to suit your dog or cat... capsules, liquid or powder. L-Isoleucine, Aspartic Acid, Manganese Sulphate, Pyridoxine HCI (vitamin B6), Ascorbic Acid (vitamin C), Sulphur, Ammonium Propionate (preservative) and natural and synthesised flavouring. Brand new product containing some of natures most effective pain-killers and anti-inflammatories. Approved by vets and, unlike some veterinary drugs, Super-Fenn has no known side effects! Ingredients: Yeast Culture, Kaolin, Calcium Carbonate, Avocado Soybean Unsaponifiables (ASU), Bromelain, Yucca Schidigera Extract, Acacia Catechu Extract, Scutellaria Biacalensis Extract, Vegetable Oil, Preserved with Ammonium Propionate. Name: Email Show you are a human! Nearly all Joint Supplements contain glucosamine and/or chondroitin but these molecules are too large to pass from the bloodstream into the joints so these supplements provide only limited results. Cortaflex contains NO glucosamine or chondroitin - instead, it contains the much smaller amino acids and saccharides which are the building blocks of glucosamine and chondroitin. These pass far more easily into the cells in the joints and make it easier for your body to repair itself. This has made Cortaflex the world's number one selling joint supplement. Joint Care is a new, lower priced, version of Cortaflex for dogs and cats. 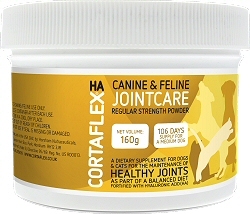 It has the same ingredients as Canine & Feline Cortaflex Powder but is just not quite as powerful so it can be used as a preventative or maintenance measure to help prolong the life of healthy joints. Canine & Feline Joint Care can be fed from as early as 6 months, especially for competition and working dogs, and helps maintain your dogs' youthful mobility.